802.11ac with 4x4 multiple-input multiple-output (MIMO) technology with three spatial streams, offering sustained 1.3-Gbps rates over a greater range for more capacity and reliability than competing access points. -Cisco ClientLink 3.0 technology to improve downlink performance to all mobile devices, including one-, two-, and three-spatial-stream devices on 802.11ac while improving battery life on mobile devices such as smartphones and tablets. -Cisco CleanAir® technology enhanced with 80-MHz Channel Support, provides proactive, high-speed spectrum intelligence across 20-, 40-, and 80-MHz-wide channels to combat performance problems due to wireless interference. 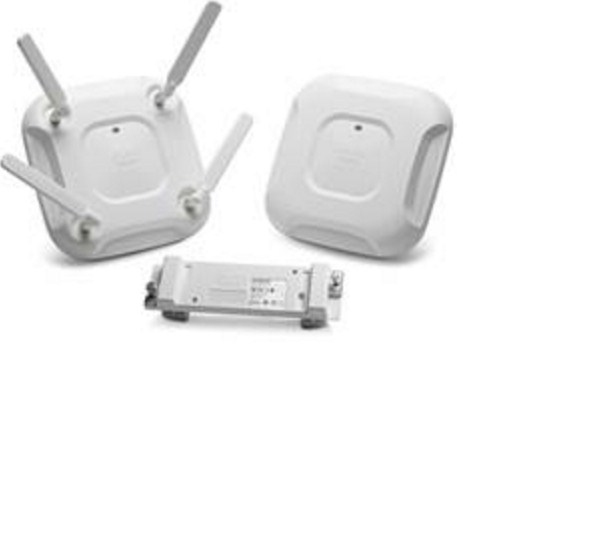 -Modular architecture design that is carried forward from the Cisco Aironet 3600 Series, enabling flexible add-on options in the form of the Cisco Aironet Access Point Module for Wireless Security, Cisco Hyperlocation Module with Advanced Security, and Cisco Universal Small Cell 8718 module, or 5310 module, all of which are tightly integrated with the Aironet 3700 Series Access Point platform and are completely field-upgradable. MIMO equalization optimizes uplink performance and reliability by reducing the impact of signal fade.